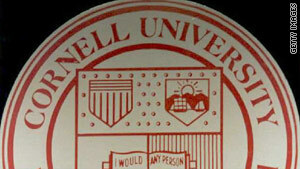 A Cornell University spokesman says three suicides are suspected in the past two months. (CNN) -- A wave of suicides at Cornell University in the past two semesters is a "public health crisis," the school's mental health initiatives director said. "We are not out of the woods yet," Timothy Marchell said of the school in Ithaca, in upstate New York. Three students committed suicide during the fall 2009 semester, and three are suspected in the past two months, according to university spokesman Simeon Moss. In February, a freshman jumped off a bridge over one of the area's well-known gorges. Last Thursday, the body of a sophomore engineering major was found under similar circumstances. Police are also searching for a body in another suspected suicide witnessed last Friday. Cornell had no suicides from 2005 to 2008, he added. And the school has consistently fallen within or below the national average for such deaths, said Karen Carr, assistant dean of students at Cornell. The national average is 7.29 suicides per year for every 100,000 students, said Paula Clayton, medical director of the American Foundation for Suicide Prevention. That means Cornell, with 19,639 students, should average fewer than two suicides a year. "I know that they've been doing a lot of outreach efforts to educate the community. Cornell is kind of a model in some ways," said Anderson, who is a staff psychologist at the Rensselaer Polytechnic Institute, in Troy, New York. In response to the current wave of suicides, Cornell will "strengthen the capacity of the community to know what to do," Marchell said. "They will be showing non-mental health professionals what role they can play, and help students and faculty get the kind of support that they need." On Wednesday, campus clubs such as Cornell Minds Matters took part in a school-wide event to promote mental health awareness. "If you learn anything at Cornell, please learn to ask for help. It is a sign of wisdom and strength."